About 25 of the protesters gathered at 10 a.m. at the blocked entry to the old KC Plant, where parts were made for nuclear weapons from 1949 to 2014. Speakers called for an end to nuclear weapon production in KC, mourning the deaths of the 154 persons whose families have told NBC Action News TV that their loved ones died from contaminants at the old plant. She led the crowd in cheering “No more nukes!” as the five crossed the purple property line. It was a protest U.S. nuclear weapons and weapons’ policies from the Heartland of America, a bolt of energy so clear it sounded as a thunderclap on a Kansas plain. Our frail shoulders hid energized spirits lifted by the hopes of humanity and pledges by most of the world’s nations to abolish nuclear weapons. We let the word go forth, we cried, to the four corners of the earth we will not be silenced. We will not acquiesce. We will not accept these weapons of mass destruction. Further, we vehemently protest the building of a new generation of these useless and suicidal weapons. 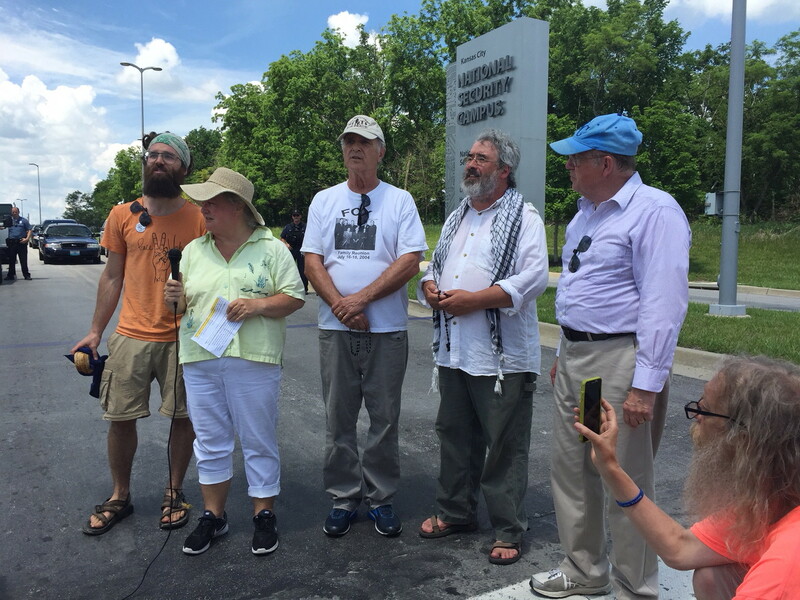 For some half a dozen years now several score of us peace activists here have converged at noon on Memorial Day on the “Kansas City National Security Campus”, ten miles south of Kansas City, Missouri, where some 85 percent of the nonnuclear components of our nation’s nuclear weapons arsenal are built. The plant’s Orwellian name hides true nature – and insecurity — of those who run the operations. 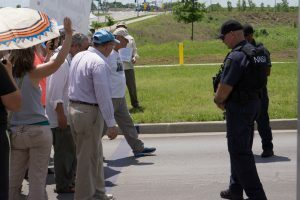 Organized by Peace Works Kansas City, we march on the plant, carrying peace signs, banners and flags, where police and security officers, in riot gear, always await us. They are serious and reasonable. They are familiar with our nonviolent intentions. This year, like most others, after a rally including expressions of protest and angry by former plant workers now suffering odd maladies and cancers, some of us break the law. This year several of us crossed a purple line on a driveway leading to the plant entrance, separating private from public property. This year I was one of five arrested. I’ve been speaking against our nation’s nuclear weapons policies for nearly four decades. It seems at some point words are not enough. This year I felt civil disobedience was required as a means of maintaining some internal integrity. 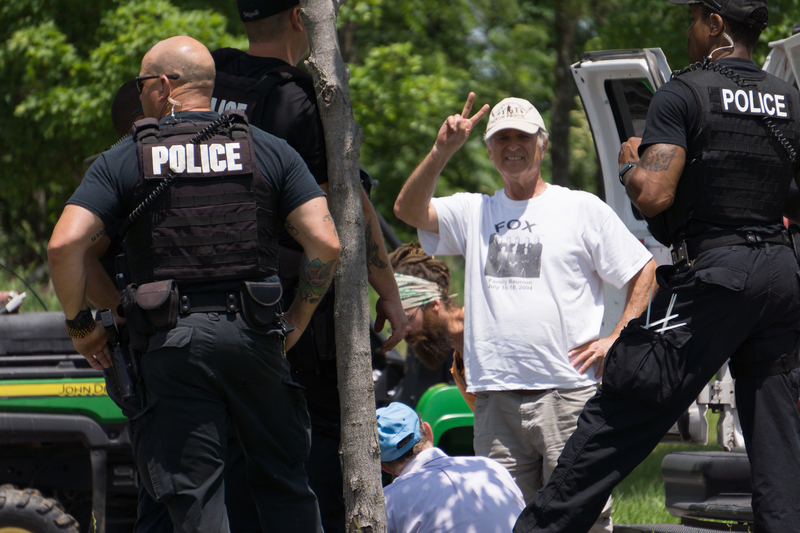 The tradition of nonviolent anti-nuclear weapon protests is not new in Missouri, where on numerous occasions Plowshares movement protesters have broken into missile silos, hammered grates and poured blood. By comparison, our protests were modest, though similarly heartfelt. Each of us came to this Memorial Day protest with a statement explaining our actions. The following are excerpts. Meanwhile, our hearts bleed for those who work here, many forced by the necessity of feeding families, to risk their lives laboring among cancer-causing toxins. Tear this plant down and use the money to build hospitals and schools. They provide truly fulfilling employment. The values we uphold here today – nonviolence, justice, peace, respect for life – are not solely own by America. They extend well beyond our nation. They are well embedded into the hopes of the human family. Don’t tell us we cannot end this nuclear madness. Don’t tell us nations lack the will. One hundred and twenty-two nations have signed a Treaty to Ban Nuclear Weapons from the planet. Sadly our nation resists. Even more sadly, we know we are living on borrowed time. Nuclear Armageddon is a real threat that no one wants to consider. And yet we must. As long as we cling to these weapons of mass destruction we face the real possibility – by intent or accident – that they will be used. Once used, life on planet Earth will be permanently altered. It could enter an environmental death spiral. The extinguishment of all human life is a real possibility. Our nation’s policy-makers like to claim a moral high ground. They call upon other nations to give up their nuclear weapons while we continue to build a new generation of our own weapons. Can anyone say this makes sense? We are right to ask: What right do we have to ask North Korea and Iran to rid themselves and further refrain from building nuclear weapons while our nation moves forward building them. Meanwhile, our nation has allocated more than a $1 trillion in the years to come to build an even more accurate and, therefore, more threatening generation of nuclear weapons. This is hypocrisy. Just last November Pope Francis, the Vicar of Christ on earth, lamented that nuclear weapons terrorize the planet. He said the very possession of these weapons is immoral – against will of God. It stands, then, as clear as a thunderclap on an open plain in Kansas that the building of these weapons is equally immoral. Do we have any choice but to speak out against these perilous weapons? I think not. I come here today with a person mission. I want to support the lives and well-being of my children and grandchildren and, by extension, all the children and grandchildren of the planet. I cry out in protest on behalf of my children: Daniel, Christine and Catherine. I cry out in protest on behalf of my grandchildren: Kai, Bodie, Nora, Tommy, Rose, Judah and Asha. I choose today to break the law as a protest to our nation’s nuclear weapons policies. It might seem an insignificant action to some. To me it is a way to preserve a modicum of personal integrity. Whatever the consequence I will sleep in peace tonight. We face a July 19th court date in Kansas City, Missouri.